I’m guilty of the last one (I compensate by power-walking from my car to work every morning.) Ever since I sent my revised manuscript to my agent, I have been knitting. A lot. Oh, I’ve been reading too, but sometimes the pins-and-needles thing would start up and distract me from my distraction. The second pair will be dark gray and is for another friend at work. There are cold hands here in California! 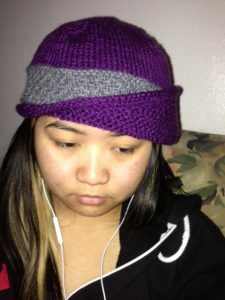 The other project I finished was a Lucy Hat, a pattern from Knitscene Magazine, Special Winter Issue 2012. My daughter agreed to model the hat for me. After I finish the second pair of fingerless mitts, I will make socks. Yes! Can’t wait! One great thing knitting does for me is it helps me think. When I’m sitting at my writing desk, staring at the words on the computer screen, stuck on a plot point or how to make a particular scene stronger, I pick up my knitting and think through it until I get that “aha” momment. It works for me about 90% of the time. I also like to brainstorm for my next book project while I knit. Speaking of my next project, I need to get cracking and my knitting needles clicking! Pins-and-needles be damned! Seriously though, I am so grateful that I have my knitting to keep me company and to help me cope with all the waiting that comes with the business of publishing. It feeds the fire of my need to create, to make something I can share with others. Most importantly, it keeps me writing. Hi there, as a commenter on the khromeatplay blog and seemingly someone who might know her IRL I was wondering what's up (her account seems inactive and her domains have been squatted). As the 2 online 'khrome's we always kept an eye on each other online and I'm just concerned about the 'other' khrome. Thanks for any info! I couldn't agree more! Knitting or crocheting for me, let's your mind wander while your fingers stay busy. It seems to bridge the present/concrete with the future/abstract. Hi there! She's doing fine. I believe she's busy with school and family. It could be the reason why she hasn't been active online. I feel sort of silly contacting you via blog comments, but I couldn't find your email. We met briefly at WDCW–I ran off after Terrie and by the time we returned to chat with Paula, you had gone. Since viewing your Twitter feed and blog, I feel you're the kind of person I'd really like to get to know better! I'm currently working on my second new adult novel, and I'm a craftsy sort myself (though more of a crocheter than a knitter, I'll admit). 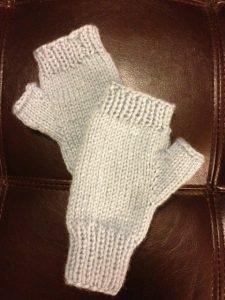 I love your fingerless glove projects! I have a pair I made for myself in high school, which I never wear since I didn't really know what I was doing and didn't make them especially well. I also have a pair my mom made for me, which are lovely. If you'd be interested in connecting, please email me: taylorlaurenross@gmail.com. P.S. In case you'd like to learn a little about me to ensure I'm not a total crazy person, my Twitter handle is @TaylorLaurenR and my website is taylorlaurenross.com. 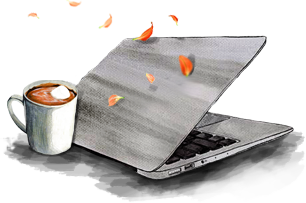 Marie writes middle grade and young adult novels in sunny Southern California. She dabbles in genetics, loves chocolate, books, and beautiful yarn. EVERLASTING NORA is coming October 2, 2018! 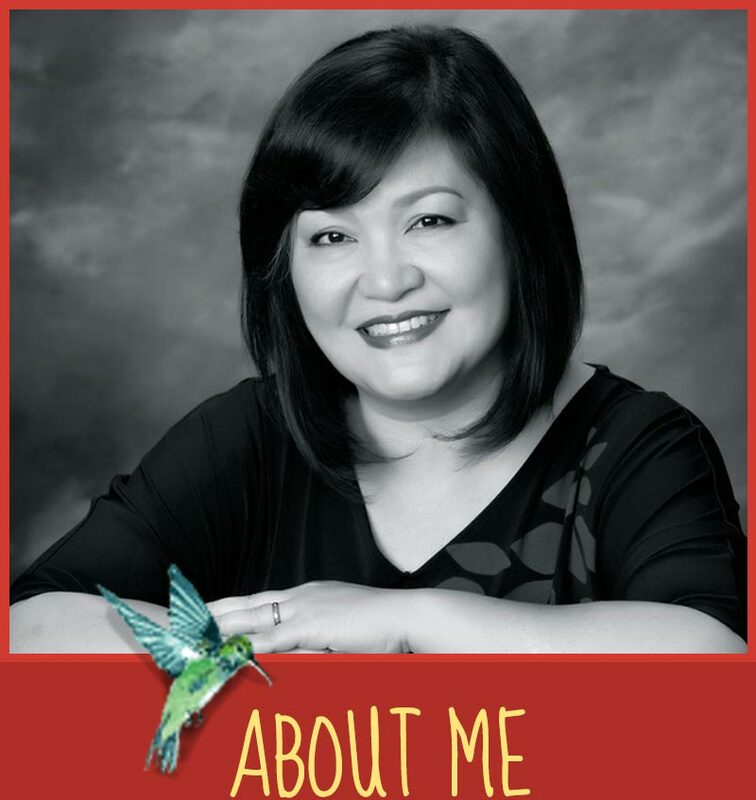 Author Spotlight | Behind The Pages With Marie Miranda Cruz – Tale Out Loud on EVERLASTING NORA is coming October 2, 2018! Pre-order + Swag Giveaway Incentives (October-December 2018) – Tale Out Loud on EVERLASTING NORA is coming October 2, 2018! Marie Miranda Cruz | Author » BOOK TOUR NEWS (wow this is getting real!) on EVERLASTING NORA is coming October 2, 2018! Marie Miranda Cruz on EVERLASTING NORA is coming October 2, 2018! Stephanie on EVERLASTING NORA is coming October 2, 2018!